P&O Britannia has finally had its royal approval by Her Majesty the Queen during a grand ceremony in Southampton on March 10th. The ceremony was a great success which began with the comedy wit of Rob Brydon who can also be found on P&O Cruises most recent TV ads. Brydon also hosted the event along with the evening Gala onboard the ship the day before. The marching band provided the grandest of atmospheres and perfect music harmony. An outstanding performance of Strictly Come Dancing dancers entertained the audience before the Royal arrival of Her majesty the Queen and the Duke of Edinburgh. Her majesty the Queen named the 142,000 gross ton cruise ship directed by Britannia captain, Paul Brown. the champagne bottle came down and hit the Britannia logo on the hull which then began a frenzy of confetti. As the ref, white and blue confetti began to settle classical artist Laura White sang the nation anthem. Later once the Queen departed she sang “Rule Britannia” also joined by the marching bands. 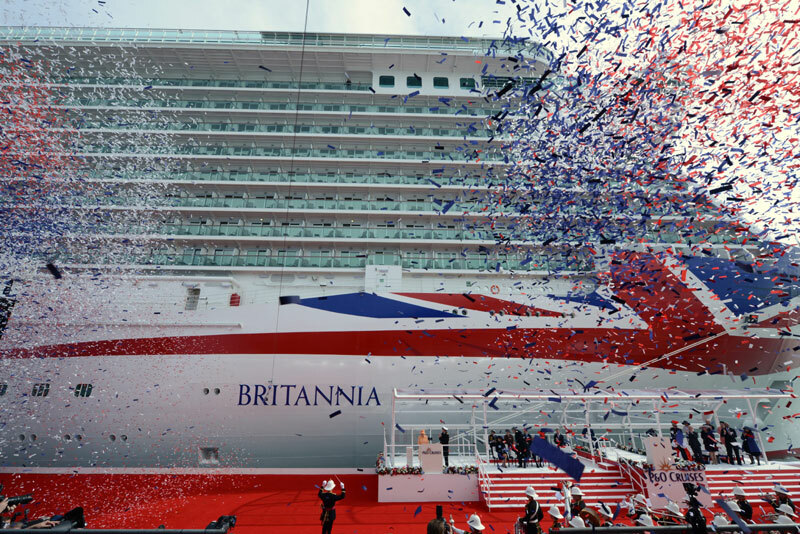 Carnival Corporation President & CEO Arnold Donald, Carnival UK Chairman David Dingle and Carnival UK CEO David Noyes along with distinguished guests, government officials and the ship’s crew helped welcome Britannia to the fleet at today’s naming ceremony. P&O Britannia was built at the Fincantieri shipyard in Italy but will showcase British cruising as she sails on oceans across the globe. For now her maiden voyage will set sail on March 14th stopping in Spain, France and Italy before arriving back in Southampton on March 28th. Anything about the biggest ever P&O cruise ship is important news so here we are with some new exciting features unveiled by the British cruise line. The largest ever cruise ship which is being built for P&O Cruises will be named as "Iona". It is the first of two new class vessels ordered by parent company Carnival. The ship name was just recently revealed which comes after the recent steel cutting event at the shipyard. P&O Aurora to become adult-only cruise ship after a major refit in 2019 adding new features not catered for the kids. The British cruise ship will join Arcadia and Orina as adults-only.